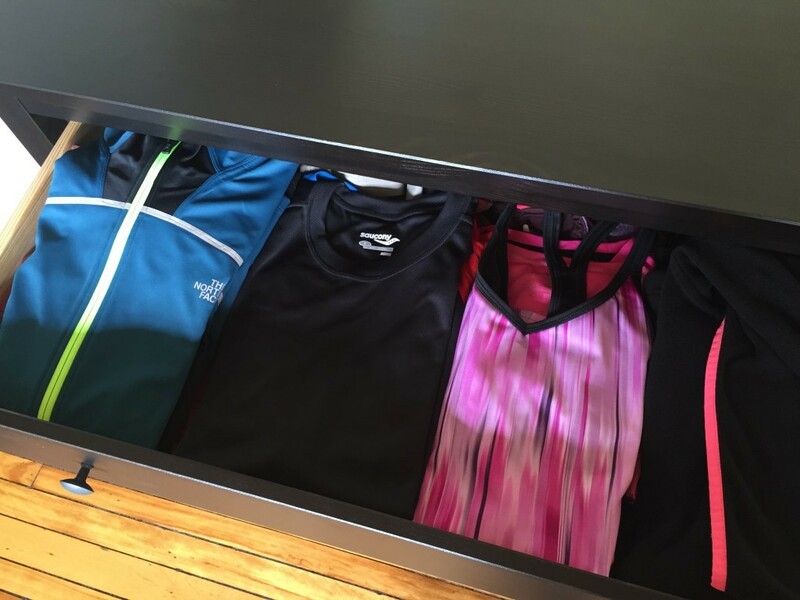 If you’re on the verge of throwing away some smelly gear that is otherwise in perfectly good shape, here are some steps you can try to get rid of smells in exercise clothes. Add a booster to the wash. 1/2-1 cup of baking or washing soda or a couple of tablespoons of borax added to your regular wash load can help get rid of unwanted scents, although this is most helpful for lightly soiled workout gear. Soak in vinegar. Vinegar is great for killing bacteria and deodorizing, and can also be used as a rinse at the end of the cycle. To soak, sort your smelly exercise clothes by color (never mix darks and whites! ), put in the sink or dishpan, fill with enough lukewarm water to barely cover the clothes and add 1-2 cups of plain white vinegar. Let sit overnight and then launder as usual. Try a hygiene rinse. 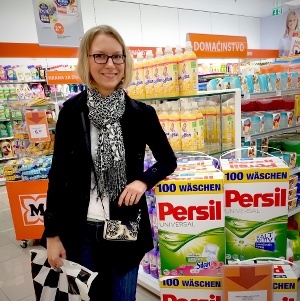 You can either try adding vinegar to the fabric softener compartment as mentioned above, or buy a specialized product like HEX Performance In-Rinse Fabric Booster or Persil Hygiene Rinse to kill off the smelly bacteria. Try a specialized detergent for exercise gear. I don’t have much experience with these, but here are some highly rated ones: Miele Sportswear Detergent , Atsko Sport Wash , WIN and Penguin . All of them claim to have a special mix of ingredients to target scent buildup, and the Miele lists quaternary compounds like the Persil Hygiene Rinse. Bring out the big guns. Warning: do this only with clothes you would otherwise toss, since there’s a chance that they will get damaged due to high temperatures affecting the synthetic fabrics. This is what I personally did with all of our moisture wicking t-shirts once they were unusable after many wash and fold cycles at the laundromat. Separate t-shirts by color (can’t stress this enough! Otherwise the running dye will give you some interesting color combinations), fill a dishpan with HOT water, add the smelly gear, a good helping of powder (!) detergent and sodium percarbonate or Oxiclean. If you’re willing to risk it, make the water even hotter by adding some boiling water from a tea kettle before putting the clothes in – do not do this if the clothes have any kind of elastic as too high temperatures will damage that and you will lose the stretch. Cover the dishpan with tinfoil to keep the heat in longer and leave overnight. The next morning rinse and wash as usual. Hot water activates the detergent and gives it much stronger cleaning power, although it can negatively affect some synthetic fabrics. BONUS STEP: Clean your washer. Make sure that your washer is clean and there is no mold growing in there. Some Affresh or Glisten can help get rid of any buildup in the machine. At least once a week run a hot load with powder detergent to keep the smells and bacteria away, and always air out the drum (especially if you have a front loader). Never use fabric softener. Fabric softener and exercise clothes just do not go together – it blocks the “pores” of the fabric even more, reducing the moisture wicking capabilities and keeping the smelly bacteria in there. Same goes for dryer sheets (although keep in mind that you should always air dry your workout clothes). Do not throw damp sweaty clothes in the hamper. If you can’t wash your exercise gear right away, either hang it up to dry or run through a quick wash with a bit of detergent and then air dry. You can put the clothes in the hamper once they are completely dry – otherwise they will keep fermenting in there and the smells will get so much worse. Up the washing temps. You know how care labels always tell you to wash in cold? Well “cold” actually means up to 85F/30C in FTC terms. But at the same time most washers will default to tap cold on the Cold setting (which can be 55F or even lower). Considering the fact that detergents don’t work properly at temperatures below 65F/18C I personally choose to risk it and wash all my exercise gear on Warm (104F/40C) or Very Warm(122F/50C) in my Miele W3038 washer. Disclaimer: you have to be ready for anything if you go against the care label! And never wash clothes that contain Lycra or other elastics on higher temps. Air dry your exercise gear. Step away from the dryer – it will “bake in” anything that didn’t come out in the wash. Instead, hang your t-shirts on hangers and dry them on the shower curtain rod or somewhere else where you have space and air flow (not in the closet). Don’t overdose detergent. It should make sense to use more detergent for dirtier loads, but in reality the detergent buildup is just going to add to the smells, so you want to use a regular dose, not more. Use a heavy duty detergent. Trapped BO is not easy to get out, so you need a heavy duty detergent no matter what the care label claims. Save your light duty wash for true delicates that you wear without breaking much of a sweat! Try a different type of detergent. If you’re been using liquid Tide and start noticing scent buildup, try the powder version. If you’ve been using All Free&Clear liquid without enzymes, try a scent-free detergent that does contain enzymes (Tide Free , or Ecover for example). Sometimes a small change can make a big difference. Pre-treat problem areas. If your shirts tend to get smelly around the armpits, once you take them off turn them inside out and spray those areas with either a mix of 1:1:1 of water, rubbing alcohol and vinegar or something like Biokleen’s Bac-Out spray . Then hang to air dry and wash as usual. This will get working on the odor causing bacteria in advance, before they get a chance to multiply even further. I had a lot of issues with smells in exercise clothes when we were using the wash and fold service at our local laundromat. I would either hand wash the shirts at home, following the care labels and using cold water, which never gave good results (I’m a firm believer that you need at least warm water to get things truly clean), or send them to the laundromat in which case they would get washed with everything else, with fabric softener and then dried with dryer sheets (both big no-nos for exercise gear). When we finally got our own washer I figured that I didn’t have much to lose, so went straight to the “big guns” step, and fortunately all of our exercise clothes survived! It’s been over a year, and by following the steps in Part 2 we’ve kept all bad smells at bay. And I have to say, I am much more motivated to actually exercise when I know that smelly clothes won’t be an issue!